Potentially malignant oral lesions are those lesions that exhibit a change in shape or color on clinical or histological appearance. These kinds of changes are due to the different types of biopsies, which, in most cases, are surgical in nature and may cause trauma for the patient. 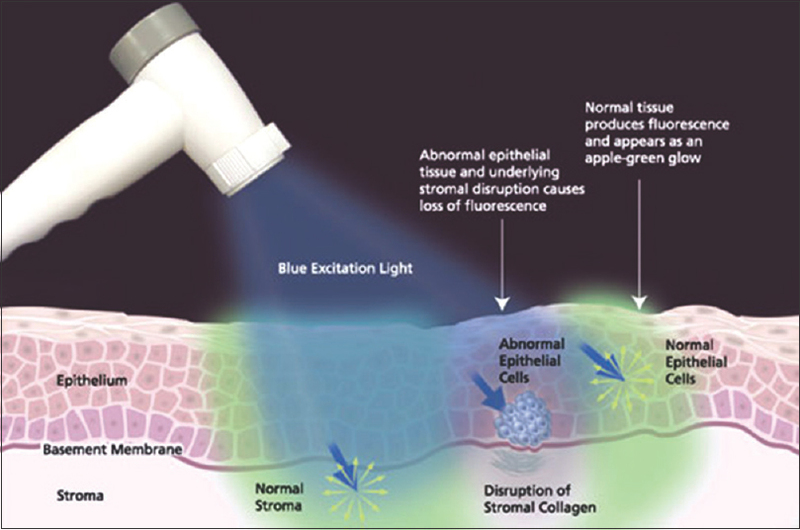 So, it is important to have another technique to detect such lesions, especially in their early stages, such as using fluorescent light. Nevertheless, the use of other instruments and machines is highly important in conjunction with visual examination, such as the brush biopsy, OralCDx, toluidine coloration, ViziLite machine, and VELscope. The study sample consisted of 748 randomized patients. These patients were attending the College of Dentistry, Al-Moasat Hospital, Al-Mojtahed Hospital, and Al-Karama Nursing home, all in Damascus. The basic forms were used to record the personal information, social information, and medical history and habits of the patients. Medical history collected two important feedbacks: 1. The influence on the way the dental treatment will be provided and 2. the intraoral lesion might be a part of a systemic disease. Many questions were asked about the patient: 1. The duration of the lesion since its occurrence; 2. the change in the size of the lesion; 3. Did the characteristics of the lesion change? 4. What are the signs and symptoms associated with the lesion, such as pain, sensation alteration, anesthesia, paresthesia, swellings, bad taste or odor, and enlargement or pain of nearby lymph nodes? 5. Any general symptoms associated with the lesion, such as fever, vomiting, nausea, etc., 6. Was there any related disorder with the lesion like continuous trauma to the site or dental diseases at the site? Then, a through clinical objective examination was carried out. In case of finding any incidence of malignancy, one of the shapes of biopsies has to be performed, and histological scanning will assure the intraoral findings. Excisional biopsy carried out in small lesions (<1 cm) and has normal readings. The biopsies were sent to the histopathology department in Damascus University College of Dentistry. After obtaining the histopathological results, comparison was made between the clinical and histopathological findings. Predictive value for a negative result (PV−) = [true negatives/(true negatives + false negatives)] ×100. The sample distribution was statistically analyzed. The sample consisted of 414 males and 334 females with a mean age of 37 years [Figure 2]. 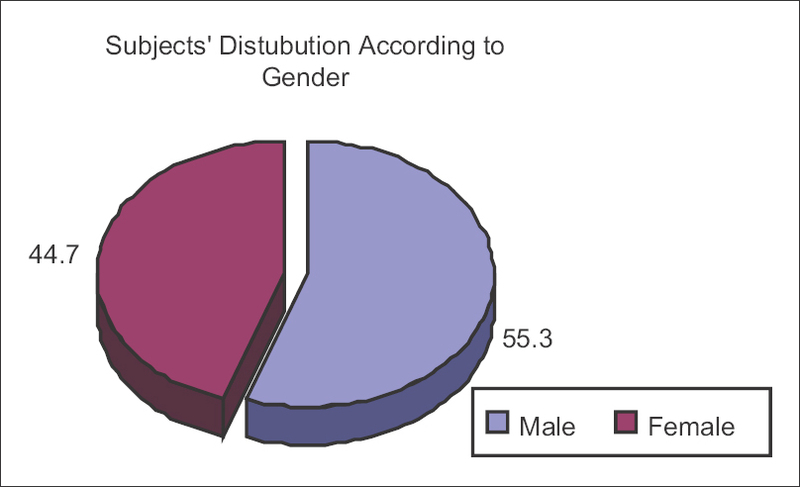 The results presented in [Figure 3] show the occurrence and gender wise distribution of potential malignant lesions. 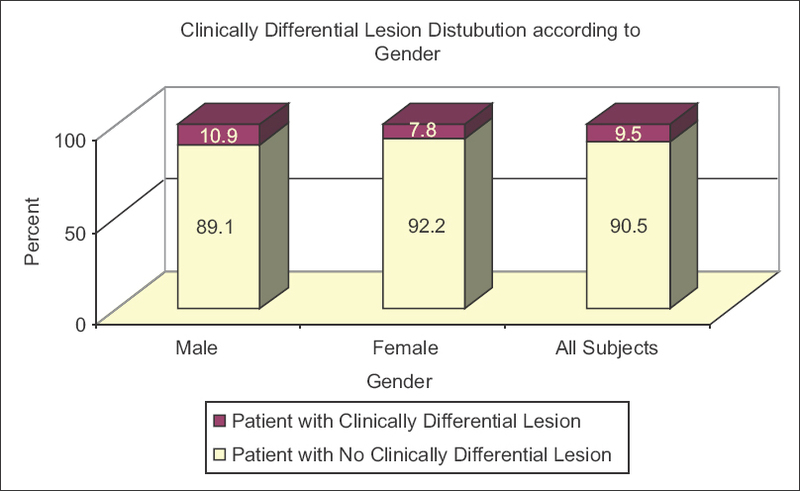 Clinically undifferentiated lesions were higher in females (92.2%) compared to males (89.1%), while clinically differentiated lesions were higher in males than females (10.9%). There were no statistically significant differences between male and female patients with potentially malignant lesions, as shown in [Figure 3] and [Table 1]. 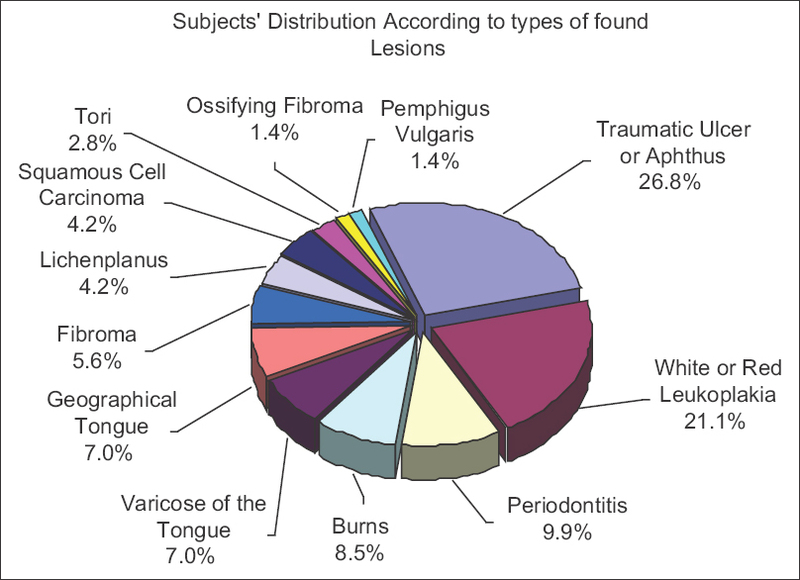 Subjects' distribution according to the types of lesions is shown in [Figure 4]. Traumatic ulcer had the highest incidence (26.8%) and ossifying fibroma or pemphigus vulgaris (1.4%) was the least common. [Table 2] [Table 3] and [Table 4] show that the percentage of benign lesions was 61.5% according to their histological analysis, while the efficiency of VELscope in detecting lesions was higher (81.7%). [Table 4] shows that P value was much lower than 0.05, so we can conclude that at 95% confidence level, there were significant differences in VELscope results between benign in biopsy group and malignant in biopsy group subjects; percentage of benign subjects in benign in the biopsy group was greater than the percentage of benign subjects in malignant in the biopsy group. Also, the percentage of malignant subjects in benign in the biopsy group was lower than the percent of malignant subjects in malignant in the biopsy group. So, VELscope was statistically effective in detecting lesions' malignity [Table 5]. To know if there were significant differences in VELscope results between benign in biopsy group and malignant in biopsy group subjects, a Chi-square test was applied as shown in [Table 4]. Kappa coefficient value was calculated between VELscope results and biopsy results, as shown in [Table 6]. [Table 6] shows that P value was much lower than 0.05, so we can conclude at 95% confidence level, there was significant agreement between VELscope results and biopsy results. Kappa coefficient value was approximately 0.5, which means that the strength of the agreement was medium. [Table 7] shows the true-/false-positive and -negative status. [Table 8] shows the sensitivity, specificity, accuracy, positive predictive value, and negative predictive value, while [Table 9] shows that accordance between VELscope and biopsy failure was 21.1% and between VELscope and biopsy success was about 78.9%. Elimination of the risk factors should be taken into consideration, such as smoking and alcohol drinking. Clinical intraoral examination and proper radiographic study are important for the detection of the lesion, but unfortunately, they are not enough for detecting malignant and premalignant lesions. Several techniques have been introduced to aid in the early detection of malignant or premalignant lesions, such as OralCDx, Toluidine coloring, ViziLite machine, Identafi machine, and VELscope. This explains the big number of articles explaining the importance of these techniques as non-traumatic procedures in comparison with surgical biopsy. Therefore, we had this study done to evaluate the role of VELscope in such detection. The machine's efficiency to act as a diagnostic instrument for the differentiation of malignant and the premalignant lesions, depends on the final decision made on the basis of the golden standard "surgical biopsy." In 2011, Matsomoto et al. studied 74 cases with 37 of them being malignant and the rest were benign. They noticed that the machine was a good aid in the detection of changes in tissues. The results of this study are concordant with that of Dayyani et al.,  as they obtained an SE of 92% and an SP of 77%. The study emphasized that the machine has a good sensitivity as the clinical examination, and it can be used as an additional device for diagnosis in patients with risk factors. The reason for the lesser value of sensitivity was that the study included all the intraoral lesions in the high-risk patients and not only the lesions that were diagnosed histopathologically as malignant or hyperplastic in nature. But we agree with them that we can use the machine as an aiding device with the clinical examination. Our study results agreed with the study of Lee and Wong  who reported in their study that the sensitivity and specificity of the machine is high and almost absolute when it comes to the diagnosis of malignant lesions; they performed their study on lesions that were prediagnosed as Saethre-Chotzen syndrome. Our results are similar to the results of Farah et al. who studied 44 cases histologically and by the machine clinically, and obtained a sensitivity of 100% and a specificity of 96%. But our results are not in agreement with that of Camily and Ledegy as their study showed that the machine is not effective in the detection of hyperplasia as the sensitivity was 30% and the specificity was 63%. The difference in results could be because the machine was depended as a single definitive diagnostic tool in their study without clinical examination. Also, we do not agree with Ardoor et al. as their study did not support using the machine in suspected lesion, as the sensitivity was 87.1% and the specificity was 20%. This drop might be due to not combining the clinical examination with the use of the machine. They noticed loss of fluorescent effect on benign lesions like varicose of the tongue and pigmentation. So, based on the results it can be concluded that we can depend on the machine as a reassuring device for the clinical examination, especially in the examination of the high-risk population, and the big advantage is that it is a non-traumatic technique used by dentists for the detection of premalignant and malignant lesions in early stages. VELscope is used an aiding tool inside the surgical theater for the detection of the borders on enucleation. American Cancer Society. Oral Cancer. Available from: http://www.cancer.org/acs/groups/content/@nho/documnets/document/oralcancerpdf.pdf. [Last accessed on 2011 Jul 02]. American Cancer Society. Oral Cavity and Oropharyngeal Cancers Detailed Guide. Last Medical Review: 2/26/2013. Available from: http://www.cancer.org . [Last accessed on 2015 Feb 16]. Oral Cancer Foundation. Rates of Occurrence in the United States. Available from: http://www.oralcancerfoundation.org/ facts/index.htm. [Last accessed on 2006 Jan 23]. Kois JC, Truelove E. Detecting oral cancer: A new technique and case reports. Dent Today 2006;25:94, 967.
International Agency for Research on Cancer, World Health Organization. IARC Monographs on the Evaluation of Carcinogens Risks to Humans: Alcohol Drinking. Summary of Data Reported and Evaluation. Vol. 44. Lyon, France: International Agency for Research on Cancer; 1988. p. 18. American Cancer Society. Alcohol and Cancer. Atlanta, Georgia: American Cancer Society Center; 2005. No. 3002.12. 2015. Dayyani F, Etzel CJ, Liu M, Ho CH, Lippman SM, Tsao AS. Metaanalysis of the impact of human papillomavirus (HPV) on cancer risk and overall survival in head and neck squamous cell carcinomas (HNSCC). Head Neck Oncol 2010;2:15. Chaturvedi AK. Epidemiology and clinical aspects of HPV in head and neck cancers. Head Neck Pathol 2012;6(Suppl 1):S1624. Leão JC, Gueiros LA, Porter SR. Oral manifestations of syphilis. Clinics (Sao Paulo) 2006;61:1616. Lissowska J, Pilarska A, Pilarski P, SamolczykWanyura D, Piekarczyk J, BardinMikollajczak A, et al. Smoking, alcohol, diet, dentition and sexual practices in the epidemiology of oral cancer in Poland. Eur J Cancer Prev 2003;12:2533. Saraf S. Text Book of Oral Pathology. New Delhi: Jaypee; 2006. p. 52. Neville BW, Day TA. Oral cancer and precancerous lesions. CA Cancer J Clin 2002;52:195215. Padmanabhan MY, Pandey RK, Aparna R, Radhakrishnan V. Neonatal sublingual traumatic ulceration Case report and review of the literature. Dent Traumatol 2010;26:4905. Lane PM, Gilhuly T, Whitehead P, Zeng H, Poh CF, Ng S, et al. Simple device for the direct visualization of oralcavity tissue fluorescence. J Biomed Opt 2006;11:024006. Satgé D, Clémenson P, Nishi M, Clémenson A, Hennequin M, Pacaut C, et al. A mucoepidermoid carcinoma in a young man with intellectual disability: Review of oral cancer in people with intellectual disability. Oral Surg Oral Med Oral Pathol Oral Radiol 2013;115:e227. Bouquot JE. Common oral lesions found during a mass screening examination. J Am Dent Assoc 1986;112:507. Baroni A, Capristo C, Rossiello L, Faccenda F, Satriano RA. Lingual traumatic ulceration (RigaFede disease). Int J Dermatol 2006;45:10967. Ceyhan AM, Yildirim M, Basak PY, Akkaya VB, Ayata A. Traumatic lingual ulcer in a child: RigaFede disease. Clin Exp Dermatol 2009;34:1868. Ozcelik O, Haytac MC, Akkaya M. Iatrogenic trauma to oral tissues. J Periodontol 2005;76:17937. Rawal SY, Claman LJ, Kalmar JR, Tatakis DN. Traumatic lesions of the gingiva: A case series. J Periodontol 2004;75:7629. Matsumoto K. Detection of potentially malignant and malignant lesions of oral cavity using autofluorescence visualization device. Kokubyo Gakkai Zasshi 2011;78:7380. Poh CF, Zhang L, Anderson DW, Durham JS, Williams PM, Priddy RW, et al. Fluorescence visualization detection of field alterations in tumor margins of oral cancer patients. Clin Cancer Res 2006;12:671622. Meena A, Satoskar SK. Early detection of oral precancerous lesions: Recent advances. Int J Med Public Health 2012;2:14. Lingen MW, Kalmar JR, Karrison T, Speight PM. Critical evaluation of diagnostic aids for the detection of oral cancer. Oral Oncol 2008;44:1022. Fitzpatrick SG, Hirsch SA, Gordon SC. The malignant transformation of oral lichen planus and oral lichenoid lesions: A systematic review. J Am Dent Assoc 2014;145:4556. TrullenqueEriksson A, MuñozCorcuera M, CampoTrapero J, CanoSánchez J, BasconesMartínez A. Analysis of new diagnostic methods in suspicious lesions of the oral mucosa. Med Oral Patol Oral Cir Bucal 2009;14:E2106. Williams PM, Poh CF, Hovan AJ, Ng S, Rosin MP. Evaluation of a suspicious oral mucosal lesion. J Can Dent Assoc 2008;74:27580. Marzouki HZ, Tuong Vi Vu T, Ywakim R, Chauvin P, Hanley J, Kost KM. Use of fluorescent light in detecting malignant and premalignant lesions in the oral cavity: A prospective, singleblind study. J Otolaryngol Head Neck Surg 2012;41:1648. Lee YH, Wong DT. Saliva: An emerging biofluid for early detection of diseases. Am J Dent 2009;22:2418. Farah CS, McIntosh L, Georgiou A, McCullough MJ. 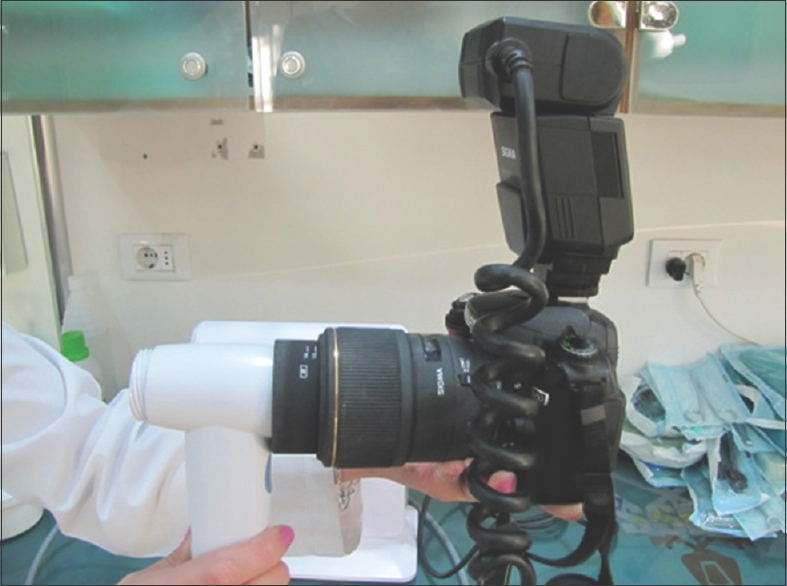 Efficacy of tissue autofluorescence imaging (VELScope) in the visualization of oral mucosal lesions. Head Neck 2012;34:85662. Ardore M, Tempia Valenta G, Pentenero M, Gandolfo S. Using the VELscope test in the evaluation of suspicious lesions of the oral mucosa oncologically. Dent Cadmos 2012;80:53842, 5456. Pewsner D, Battaglia M, Minder C, Marx A, Bucher HC, Egger M. Ruling a diagnosis in or out with "SpPIn" and "SnNOut": A note of caution. BMJ 2004;329:209-13.